Sirmione Castle is situated in the historic town Sirmione in northern Italy. The Lombardy Province is marked by the beauty of Lake Garda. The town of Sirmione is an interesting historical center which is a medieval castle with the same name that separates the southern part of the lake. Fortress Sirmione stands beautifully on the shore of a long peninsula among the blue-green waters of Garda. The castle and port have turned the village into an administrative center of the neighborhood. At the farthest point from the coast of the town are the ruins of an ancient Roman villa, known as, Caves of the camp. In the Roman building there lived a famous singer of love lyrics. In his memoirs he writes that the villa is conveniently located so that you can fish in the lake via the window. Sirmione Castle is also known as Rocca Scaligera and it is believed that the castle was built by one of the largest families in Verona. 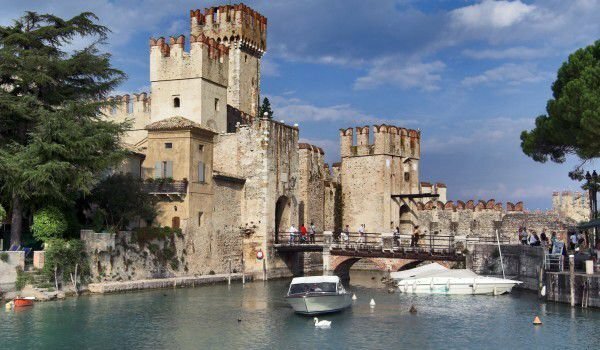 Until the 13th century fortress Sirmione existed as an independent commune and it was after this that it then fell into the hands of the Scaliger family. It is assumed that Mastino I della Scala has ordered construction of a medieval fortress that has long functioned as a military fortification. Ink decided to build a castle Sirmione to demonstrate the supremacy and majesty of its kind. For this purpose it was necessary fortress that is fair for "noble" its descent. The castle is located 2.5 miles from the coast along the small peninsula, which had two advantages in that time. The first is that Sirmione was extremely difficult to access in case of an attack and therefore easy for defensive tactics. Another advantage of the location of the fortress Sirmione is that the small peninsula boasts of great beauty and a peaceful atmosphere. Once the castle Sirmione had built a drop down bridge, but today it was replaced by a pedestrian way. The cars there are not allowed, except in the case of some guests of the hotels.